It's no big secret that a blazer is a go-to weapon in every fashion girl's styling arsenal. You don't need us to tell you should have the staple in failsafe black, navy, and a playful pop of color (a red or pastel pink blazer will move mountains—trust us) in your wardrobe at all times. But this season has given us reason to carve out one more spot in our wardrobes (sorry, Marie Kondo) for a bright white style you're about to see everywhere. So what's all the hype about? The fresh color lightens up the tailored style's typically heavy shape, which means it will prove to be even more versatile. 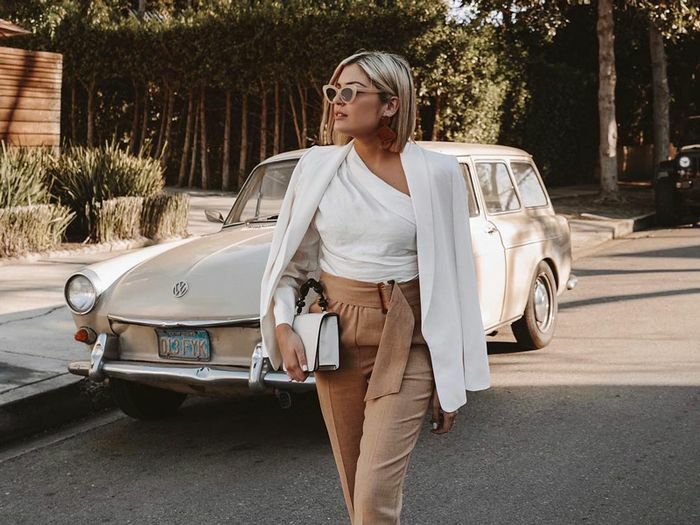 Even in stiffer wools and acrylic fabrics, a white blazer manages to make the most buttoned-up office looks feel breezy and relaxed—just what the doctor ordered after a long winter of bundling up. And whether it's rendered in linen or lightweight cotton, it's sure to be the jacket you'll be sporting to every brunch date this spring. It doesn't get more versatile than this double-breasted style. Who knew double-breasted blazers and frilly blouses were a match made in heaven? We've got your go-to brunch jacket right here. Pink, white, and red—what's not to love? Creamy animal print means you're ticking off two trends in one. You'll have this white J.Crew blazer in your collection for years to come. If stark white isn't your style, go for something creamy instead. Making a strong case for monochrome.